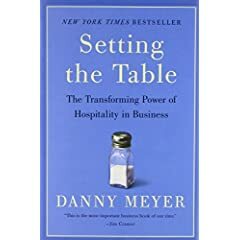 Reading and enjoying Danny Meyer's book, Setting the Table. I particularly like Meyer's distinction between customer service and hospitality--something I never thought about before. Meyer writes, " Hospitality exists when you believe the other person is on your side. The converse is just as true. Hospitality is present when something happens for you. It is absent when something happens to you. Those two simple prepositions –for and to express it all." I love this piece from Seth's Godin's Blog: "Here's the short version: If you try to teach a customer a lesson, you've just done two things: a. failed at teaching a lesson and b. lost a customer" Amen! If the customer receives 'service' but feels like it's being given as a favor, or worse, with reluctance or a with punitive spirit, then the customer might take their bidness elsewhere. A Customer Service Shout Out to Comcast. I dumped Verizon DSL last year after years of service because my Internet went out one day and they didn't care. And that is the mercifully short version! I promptly ordered Comcast Internet and have been enjoying their speedy connection ever since. Until my Internet slowed to near halt a few days ago and my cable tv went on the fritz at the same time. I called Comcast and quickly got through to a live human being (my favorite kind, mind you.) They said they could be out the next morning, but that wasn't good for me, so we scheduled the morning after. Not only did the nice Comcast man show up 1/2 hour early, he was pleasant, professional, communicative, quick, and ended his visit by saying, "of course there will no charge today." Of course! I don't know if it's just that my expectations have been so severely lowered by so many terrible interactions (with Verizon, with banks, with my oil company, etc., etc.) but boy did I feel good about Comcast. Even better than I did before my Internet and TV fritzed out. It's almost a bit cliche, but how true nonetheless - every service problem is an opportunity to strengthen the connection with the customer. From "Dont Coddle Me at Work" courtesy of the Chief Happiness Officer: "Before people can be happy at work, the thinking goes, they must be shielded from all manner of ills: angry customers, unrealistic deadlines, unfair decisions, overwork, boring meetings, stress, annoying co-workers, insecurity, diffiult situations, hard choices - you name it. Wrong. The best and happiest workplaces in the world haven’t become so by shielding their people from problems, but by giving their people the skills, the energy and the freedom to deal constructively with problems." Hey, that sounds just like Nordstrom. Don't set rules designed to deal with every possible worst case scenario; give your employees the power to deal with problems if and when they occur. Like Robert Spector writes in Lessons From the Nordstrom Way, "Dump the Rules!" Each one is a barrier between you and your customer. Lovin the Elf! Library Elf, that is. I signed up for Library Elf last week after attending an informative presentation by Ralph Bingham of the Gloucester County Library System. GCLS has been actively promoting Library Elf to the delight of their customers. I didn't think I would be able to participate since my library is a Triple I shop, but lo and behold the good people at Library Elf set me right up. I mentioned this to an administrator at my local library who was happy to hear the news. A recent customer survey had just revealed that "underdue" notices were greatly desired. This is the kind of simple convenient service that can have a great impact on customer satisfaction and also raise employee morale by reducing staff contacts with grumpy customers complaining about fines. I've been away from the blog for what feels like a while--but for a good reason! My wife and I met up with some friends that came from the west coast and we did a seven day cruise to the western Caribbean. Lots of rain, no sun, but a good time was still had by all. We swam with dolphins, played with monkeys, ate, slept, read. Who needs the sun anyway?